Food and Beverages will be served from 5pm -7:30pm and are not included in music fee. Food and Beverages will be served from 8:00pm -10:00pm and are not included in music fee. COLLEGE STUDENTS, $5 MUSIC FEE WITH STUDENT I.D. The Jāzeps Vītols Latvian Music Academy (JVLMA) Jazz Combo features five Latvian jazz musicians with a unique approach to music. Experienced in performing with big bands, duos, string quartets, leading their own ensembles and participating in various projects combining ethnic and contemporary music, they add their very own sound to this collaboration. Edīte Štrausa (vocals), Vadims Dmitrijevs (trombone), Krists Saržants (piano), Uģis Immers (double bass) and Jēkabs Zemzaris (drums) have met at Jāzeps Vītols Latvian Music Academy. “It’s extremely important to add your own personal touch to the music you make, no matter what you play. It will always make the composition alive and live on after it’s played”, says Krists. Their inspirations vary from classical and jazz genres to rock and even hip hop. From Bach and Ellington to Pantera and Jay Z they create a distinctive voice of theirown. Indrikis Veitners is a jazz saxophonist and clarinet player hailing from Riga, Latvia where he is an associate professor and head of the jazz department at Jazeps Vitols Latvian Music Academy. He holds a Doctor of Arts Degree and is a leading expert on Latvian jazz history. Dr. Veitners has participated in jazz research conferences in Denmark, Netherlands, Great Britain, Switzerland, Austria, Poland, Germany, and Estonia. His scholarly works have been published in Muzikas Saule and other leading newspapers. As a performer he performs professionally with the Latvian Radio Big Band, the Ethno-jazz group Patina, the Mirage Jazz Orchestra, and the Dixieland Dream Team 1935. Dr. Veitners has also appeared on over a dozen recordings with the finest musicians in Europe. Dr. Veitners’ has been a featured guest performer at the University of Nebraska Omaha’s Great Plains Jazz Festival in the United States of America. The UNO School of Music is one of three academic units within the College of Communication, Fine Arts and Media. With a metropolitan mission of community engagement, music students are highly involved in performance and education throughout the Omaha community. Students at UNO have performed with the Omaha Symphony, Opera Omaha, Omaha Performing Arts, Omaha Community Playhouse and a variety of arts venues throughout the city. Our international touring program has linked to the global community with students visiting Latvia, Austria, the Czech Republic, France, Germany, Ireland, Japan, China, Lithuania, and Mexico— just to name a few! Based in a student-centered curriculum, we offer comprehensive undergraduate programs in music education, music performance, music technology and music entrepreneurship. Students study on their applied instrument or voice with faculty members who have the expertise to provide students with a strong foundation of musicianship. Small class sizes and team-taught courses give students a lot of personal attention—attention that makes the difference for our students’ academic success. For non-majors, the school is a place for many to continue the enjoyment of music making. Ensembles are open to both majors and non-majors and can provide non-major students with an outlet for creative expression and a place to make connections with other students. In addition to our numerous ensembles, courses in music appreciation, jazz studies, world music, rock history, and opera are all available for study. Whether you are seeking a degree in music or are interested in participating in a music course or ensemble, the UNO School of Music is an exciting place with many wonderful opportunities! In addition to hosting the annual UNO Great Plains Jazz Festival, the UNO Jazz Ensemble makes regular appearances at nationally recognized jazz festivals and at state and regional conferences. UNO Jazz Ensembles and Combos have been selected multiple times by nationally competitive recorded audition processes to perform at premier festivals and conferences including the University of North Texas Jazz Festival, the Notre Dame Jazz Festival, the Midwest International Association for Jazz Education conference, and the North Central National Association for Music Education Conference. UNO Jazz Ensembles have toured Europe five times (2003, 2008, 2013, 2016, and 2019) with performances in Latvia, Lithuania, Estonia, and Finland. 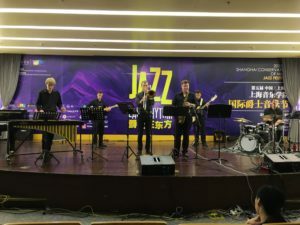 UNO Jazz has also appeared in Asia five times (2010, 2012, 2015, 2017, and 2018) with performances in China, Japan, and South Korea. The UNO Jazz Ensemble has performed with many internationally renowned guest artists including Peter Erskine, Slide Hampton, Eric Marienthal, Jon Faddis, Randy Brecker, Diane Schuur, and many others.